Kung hei fat choy -- what a great way to begin the Year of the Horse! 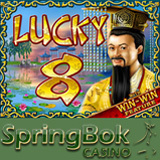 There's a new Asian-themed slot game called Lucky 8 at South Africa’s favourite online casino, Springbok Casino where you can get a casino bonus up to R1500 and 15 free spins on the new game. Lucky 8 is a 25 payline Asian-themed slot game with exotic images of Emperors and Empresses spinning on its reels. The Emperor symbol is wild and multiplies wins by up to 8x. The new game is arriving just in time for Chinese New Year, a 15-day festival that begins January 31st this year. 3 or more scattered Lucky 8 symbols triggers 8 free spins with multipliers. During the bonus round a gong reveals a random prize multiplier of up to 8x. Lucky 8 has RTG’s popular Win-Win feature that ensures players never end their free games empty handed. If wins during this round are less than 8x the triggering bet, the Win-Win feature awards a bonus of 88x that bet. To claim a 75% deposit bonus, up to R1500 enter coupon code LUCKY8BONUS when you deposit. For 15 free spins the coupon code is LUCKY8FREE. Theses offers are available until January 31, 2014 only.